District Court Ferozepur Recruitment 2017 – Stenographer, Operator & Clerk Posts. Check your eligibility. District Court Ferozepur Recruitment 2017 – Stenographer, Operator & Clerk Posts: The notification for the recruitment of 7 Stenographers, clerks and operators has been released. Interested candidates can apply for these posts after checking if they meet the eligibility criteria. Last Date of Applying Online 27/10/2017 at 5:00 P.M. Exam Date for Stenographers (for candidates whose names start with the alphabet A to P) 06/11/2017 at 9:30 A.M. Exam Date for Stenographers (for candidates whose names start with the alphabet Q to Z) 07/11/2017 at 9:30 A.M. Exam Date for Clerks (for candidates whose names start with the alphabet A to P) 08/11/2017 at 9:30 A.M. Exam Date for Clerks (for candidates whose names start with the alphabet Q to Z) 09/11/2017 at 9:30 A.M. Exam Date for Photostat Machine Operators 10/11/2017 at 9:30 A.M.
Grade-III 18 to 37 years as on 01.01.2017. Relaxation of age will be given to the candidates of reserved categories as per rules/instructions of the Hon’ble High Court as well as Punjab Government B.A. Or B.Sc or equivalent thereto from a recognized University with minimum speed of 80 W.P.M in English Shorthand & 20 W.P.M. In transcription of the same and having proficiency in operation of computers, Word Processing and Spread Sheet and He/She should have passed matriculation examination with Punjabi as one of the subject. Clerk 18 to 37 years as on 01.01.2017. Relaxation of age will be given to the candidates of reserved categories as per rules/instructions of the Hon’ble High Court as well as Punjab Government B.A. Or B.Sc or equivalent thereto from a recognized University with knowledge of Computer and He/She should have passed matriculation examination with Punjabi as one of the subject. Photostat Machine Operator 18 to 37 years as on 01.01.2017. You should come to the exam venue with your complete bio-data, copies of relevant documents, and minimum two passport size photographs. 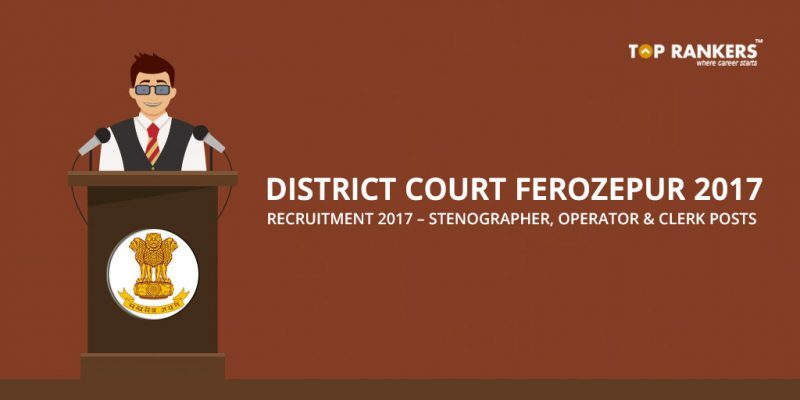 Did you find our post on District Court Ferozepur Recruitment 2017 – Stenographer, Operator & Clerk Posts helpful? Keep visiting our site regularly for more updates like this.